Thomas Madden | Andrew Holt, Ph.D. Above Image: Cover of issue 4 of the Islamic State’s glossy English language propaganda magazine. Many of its issues contain references to the crusades or explicit crusading rhetoric. In 2015 I had the pleasure of co-editing (w/Alfred J. Andrea) the book Seven Myths of the Crusades (Hackett, 2015). It includes seven essays by prominent crusade historians dealing with various popular modern “myths” related to the medieval crusading movement. While recently preparing for an upcoming talk at Georgia Southern University, titled “The Modern Politics of Medieval Crusading,” I was carefully rereading the various chapters of Seven Myths, and thought it worthwhile to briefly highlight one of them here. The subject of their essay is a potentially controversial one, particularly as it argues that much of the Islamic world’s modern memory of the medieval crusades, a memory which frames the crusades as a largely unprovoked Christian attack on the Muslim world, serving as a constant source of division and mistrust today, was only developed in the 19th and 20th centuries during an age of western imperialism that influenced its construction. Moreover, Ed and Mona’s essay emphasizes that it was essentially the modern imperialist west that taught the modern Muslim world to hate the crusades, as there had been relatively little concern about them expressed in texts by Muslim authors in the centuries prior. This entry was posted in Uncategorized and tagged Arab Conquests, crusades, Edward Peters, Islamic State, Jonathan RIley-Smith, Mona Hammad, Muslim memory of the crusades, Paul F. Crawford, Seven Myths of the Crusades, Thomas Madden on March 2, 2017 by Andrew Holt Ph.D.. 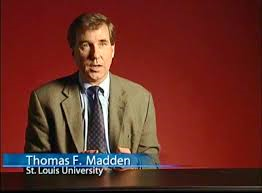 In his entertaining 2012 essay for Revista Chilena de Estudios Medievales, St. Louis University Professor Thomas Madden, perhaps the leading U.S. historian of the crusades, considers the widely repeated claim that the crusaders waded in blood up to their ankles or knees during their violent conquest of Jerusalem in 1099. Then Madden made an interesting point. This entry was posted in Uncategorized and tagged 1099, First Crusade, Jerusalem, Massacre, Rivers of Blood, Temple Mount, Thomas Madden on October 7, 2015 by Andrew Holt Ph.D..